Goodwell, Okla.—The Panhandle State men's basketball team took charge Thursday evening, posting their first Sooner Athletic Conference win of the season with a 74-64 victory over Mid-America Christian University. The Aggies owned their first lead of the night eight minutes into the first half (15-12). Baris Ulker shifted the score with a layup and free throw, and teammates Alan Hodge Jr. and Thomas Ellis hit back-to-back shots to edge a seven-point advantage for the Aggies at the 11:33 mark (19-12). The Aggies left the court leading 37-32 at halftime. Ulker was leading the game with 15 points at the half, and finished the game with a season-high of 30 points to his name. Head Coach Aaron Coombs commented on his junior forward from Istanbul, Turkey, "Baris [Ulker] stepped up big time with big shots." Second-half scoring matched the first-half efforts of both teams as Panhandle totaled another 37 points and MACU matched with 32. Sophomore DK Sumo also put in a repeat performance scoring nine points in each half to total 18 on the night. Ellis and Hodge combined for 17 points and shared the game-high in assists with four apiece. The Aggies averaged 43.3 percent from the field and went 8 of 22 from three-point territory; Ulker tallied four treys and Sumo accounted for three. The team shot 73.7 percent from the free throw line, sinking 14 of 19 attempts. Coombs made note of Sumo's efforts stating, "DK [Sumo] carried us." MACU shot 32.8 percent for the game, making just 5 of 28 shots from beyond the arc; the Evangels averaged 82.6 percent at the line, adding 23 points on free throws for the game. The Aggies outmatched their opponents at the boards 41-35 with Ulker earning a double-double with a game-high of 15 rebounds. Sophomore Hank Harrel came down with nine boards and Sumo and Hodge had five rebounds each for the Aggies. Coach Coombs continued sharing, "I am just really happy for our returners; to beat MACU and get off to a good start with a conference win. This is a confidence win." He added, "I'm also just really proud of how hard we played and how well we defended; our guys followed the scout report very well. Everyone had a hand in this win." 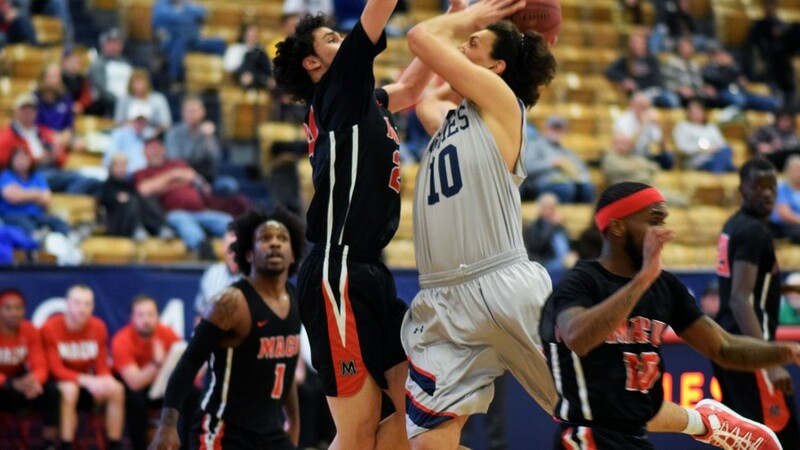 With a 6-1 season record and one SAC win under their belts, the Aggies face another conference matchup against the University of Science and Arts this Saturday, Dec. 1 at 4 p.m. in Anchor D Arena. Fans are invited to bring their loose change for the SAAC Penny Wars with proceeds going to Christmas Cheer for Children. Guests may also bring new, un-wrapped toys for the Goodwell Police Department Toy Drive; each donation receives entry to win a singed P-logo basketball, autographed by both Panhandle State basketball teams. An Ugly Sweater Contest will also take place during halftime of the men's game, with a prize awarded to the winner.